Suitable for the vast majority of surround speakers. Decorative matte black appearance. Adjustable height: 68 - 110 cm. Bringing cinema sound to your ear level. Robust speaker stands for surround sound speakers. Hidden cable routing. Silver finish. 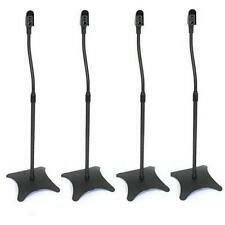 Functional Set of 4 Speaker Stands at an affordable price. 2 x 2 Stands. 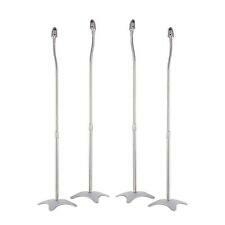 Adjustable height: 68 - 110 cm. Adjustable height: 71 - 106 cm. Decorative matte black appearance. Weight per stand: approx 2kg. Isolate your HIFI gear / Playstation / CD Player / Amplifier / AVR / Printer / PC or Laptop / TV stands & much more. These (Clear) Polyurethane Rubber Gel Pads (x4) are great for adding to your speaker cabinets/stands or replacing old ones. 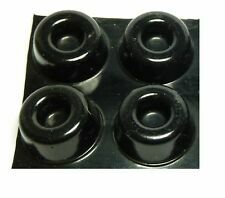 These (BLACK) Polyurethane Rubber Gel Pads (x4) are great for adding to your speaker cabinets/stands or replacing old ones. SEEN CHEAPER?. The pads have a powerful adhesive system,but can easily be removed if needs be. Takes 4 Adam Hall Speaker Stands with room to spare. A top quality Speaker Stand bag at an affordable price! NOW WITH REINFORCED END PANELS! STANDS HANGERS ETC. All parcels must be signed for and cannot be left in gardens, porches or sheds etc. Hidden cables (speaker cable not included). Adjustable height - from 70cm to 120cm. 4 x Soundstyle Z2 Speaker Stands two Pairs "What Hifi Five Star Reviews"
2 pairs of stands = 4 individual standsThe Speakers are not included ! Description: Specification: 100% Brand New Name: Stainless Steel Speaker Spike Pad Suitable for Amplifier, CD player, DAC, Power enclosure, Turntable, etc Hard and safe, help make equipment more stable, improve sound No screws needed Material: 304 Stainless Steel Size: approx. 27 x 29mm (Dia*H, height is adjustable) Color: Silver Note: Due to light and screen difference, the item's color may be slightly different from the pictures. Please allow 1-5mm deviation due to manual measurement. Package Included: >4 set x Speaker Spikes (with Adhesive Tape). IF INTERESTED - I HAVE FOUR OF THESE. The small polyurethane main driver, made this model 3db more efficient than that of the LS3/5a. SPEAKERS HEIGHT : 43.1 CM. also matched inspection tickets. Stands - 60 CM high. MATCHING SERIAL NUMBERS - 4474 A & B.
Aluminium Speaker Spike Shoes (set of 4). and maintain all of the acoustic benefits of the original Speaker Spike. The Cone dimple is 90 Deg inclusive, to take any type of Spike. Over 10000 Pads sold worldwide and used with every Speaker make imaginable. Material: Indonesia Ebony (High specific density will not float in water). 3M adhesive tape for spike adhesive on the speaker. 4 x Speaker Spike. Spike size: approx. 23 x 20mm (Dia. Pad size: approx. ). in very good condition. My speakers are now fixed on the wall, hence the sale. Sturdy 250mm base. Weight per stand approx. 250mm base. Universal use, for almost all speakers. 68 - 110 cm (adjustable). 4X GENUINE BOSE BLACK UFS-20 FLOOR & TABLE CUBE LIFESTYLE ACOUSTIMASS SPEAKER STANDS. USED CONDITION - BUT DOES THE JOB Condition is Used. Dispatched with Royal Mail 2nd Class. These spikes are manufactured by Monacor Audio and are of highest quality. Description: Specifications: Material:Chrome plated copper Color:Silver Size:As picture show Feature: ＞Can be used for hifi speakers or speaker frame. ＞It can be put under the speaker,or under the shock board and anti - shock frame,it's sharp end point to the ground,can minimize the harmful vibration. ＞Can eliminate the pollution between the ground and the speaker,get the pure natural sound effect. 3M adhesive tape for spike adhesive on the speaker. Material: Indonesia Ebony (High specific density will not float in water). 4 x Speaker Spike. Spike size: approx. 23 x 20mm (Dia. 4 x Base Pad. Pad size: approx. ).